We’ve seen the upcoming Samsung Galaxy F aka Galaxy S5 Prime leak in two different Gold variants and now, we have a new leak showing off the device in the same “glowing gold” hue. The previous two renders did not show off the device’s lower part and this new Galaxy F press render leak shows us the full front of the device. We can see the usual Samsung key arrangement below the display, a hardware home button and capacitive buttons for recent and back. The new leak also shows the same date and time as the previous two leaks. They show the date to be Wed, 12 September, which is strange, considering 12 September this year is a Friday. While on the front, the device does look similar to the other Samsung devices but the back looks surely nicer, as we’ve seen in the previous leaks. 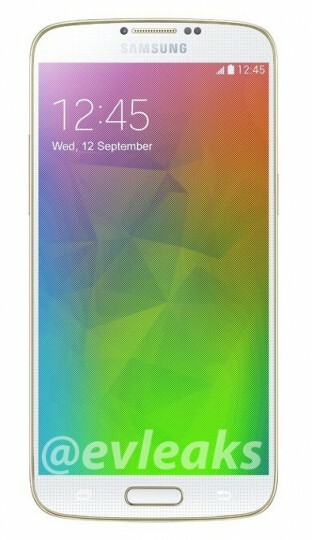 The bezels on the sides are also lesser than the Galaxy S5. There has been no confirmation as to when Samsung plans to announce the device. The QHD display packing Galaxy S5 LTE-A is already on sale in South Korea, so we can expect the Galaxy F to be launched globally soon. While some reports suggest a July launch, some suggest a September launch. The Samsung Galaxy F has been rumored for a long time and we’ve come to know some specifications. Take a look below and do tell us, what you think of it.